Help your skin LOOK and FEEL years younger with noticeable results in a couple of days! Join the growing legion of users that have felt the benefits of using JJ Labs Skin Solutions' products! We answer questions within 24 hours and ship the same or next business day so as to provide you with the best customer service! 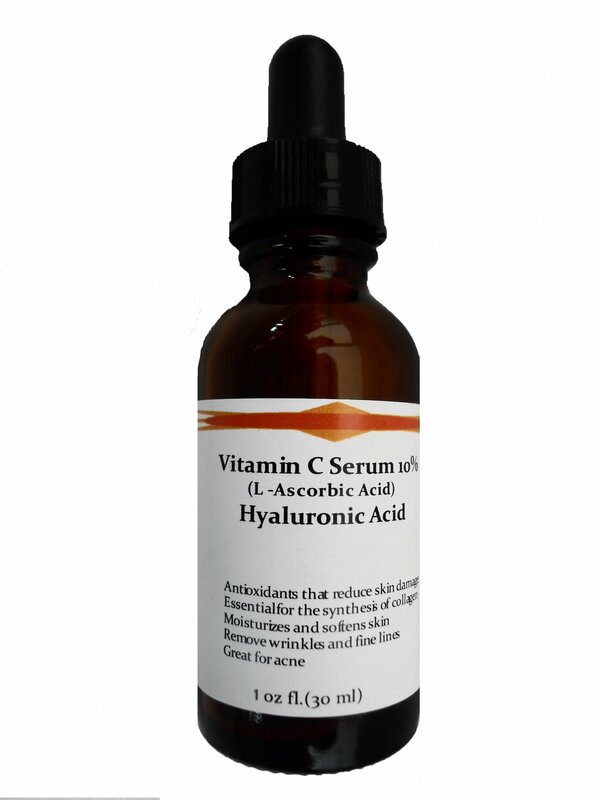 Vitamin C (L-Ascorbic Acid) 10% with Pure Hyaluronic Acid Anti Aging Serum 1oz. Several studies have highly recommended applying vitamin C onto the face daily to protect against UV-induced cell damage. This sun damage not only causes premature aging, but also many forms of skin cancer. Vitamin C has many other beneficial properties, including being one of the few ingredients that has a scientific base to show that it reverses signs of aging for your skin. Vitamin C (L-Ascorbic acid) has been shown to stimulate collagen, decrease wrinkle depth, and have lightening effects on pigmentation. We've all heard about how good vitamin C is to maintain strong bones and teeth and for our immune system. It protects your body from infection and quickens our ability to heal and recover from wounds. But vitamin C is also necessary for collagen, the main structural protein found in our connective tissues. Even though vitamin C fights against bacteria, viruses, and infection, you can still catch a cold. But don't worry! Also serving as an antihistamine, Vitamin C also helps to lessen some of the most unpleasant effects of the common cold, including aches, inflammation, and a stuffy nose. Vitamin C is a powerful and effective antioxidant that protects our bodies from free radicals that cause oxidative stress. Excessive oxidative stress, or "cellular rust," can lead to many severe medical conditions and is associated with many different types of cancer, including lung, mouth, throat, colon, stomach and esophagus. Vitamin C also helps to regenerate vitamin E (another useful antioxidant). Vitamin C has been proven to lower blood pressure, and therefore lessen the chances of hypertension and its harmful consequences, such as cardiovascular disease. Along with lowering your blood pressure, vitamin C ensures the proper dilation of blood vessels, which can help prevent many diseases, including angina pectoris (inadequate supply of blood to the heart that causes severe chest pains). Vitamin C dramatically lowers your blood's lead level. This is especially important for people living in urban areas. Studies have shown that lead toxicity can lead to behavioral and developmental problems in children, such as learning disabilities and lowered IQ. Adults can suffer from kidney damage and high blood pressure. Hyaluronic acid, also known as HA, is a natural compound found in skin that has many important functions, including holding in moisture, providing cushioning, aiding in tissue repair, holding together the skin structural components collagen and elastin, and helping create a protective barrier against microorganisms. Many skin care products contain hyaluronic acid. Topical products containing HA are effective at moisturizing skin cells, which prevents water loss and protects the skin from dirt and other pollutants. Since hyaluronic acid holds moisture well--holding up to 1,000 times its weight in water--it is commonly used in moisturizers. It serves to deliver AND hold water to the skin. As a large molecule, it doesn't permeate deep into the skin and stays near the surface to moisturize the skin's surface layers. The loss of natural hyaluronic acid is one of the most common causes of wrinkles, so the idea of putting HA back into the skin to repair wrinkles makes sense. Hyaluronic acid fillers, like our Vitamin C (L-Ascorbic Acid) 10% with Pure Hyaluronic Acid Anti Aging Serum are useful for reducing or removing wrinkles. We keep our hyaluronic acid PURE and ALL NATURAL to make your skin look younger, smoother, and firm. Hyaluronic acid based products are considered extremely safe. There are few allergic reactions or side effects involved with using hyaluronic acid, though some people may experience a mild, temporary redness or swelling after an injection. We keep our product for topical use only so as to reduce the chances of this! Repeated use of hyaluronic acid will maintain moisture levels in the skin, preventing skin dehydration. Directions: Apply sparingly wherever needed. Suggested for nighttime use but can be used whenever hydration is needed. Regular exfoliation is recommended. 1. Many companies mislead their consumers by putting in tiny amounts of vitamin C so they have to use (and purchase) more for the desired effect. In order to best combat this unfair practice, be sure to look at the concentrations listed! Do not let fancy labels or expensive products trick you into buying them. All of our products contain 10% or more vitamin C in order to be as effective as possible! 2. Vitamin C does not work the same for everyone. Although not everyone may get the age-reversing benefits of vitamin C, everyone should use vitamin C to protect from UV-induced cell damage. 3. Watch for yellowing of your serum - it indicates oxidation. As it undergoes oxidation the ascorbic acid takes on a yellowish tinge, so it is important to check your creams or serums before you put them on your face, and if there is any yellow discoloration, DISCARD. 4. Do not buy vitamin C preparations that are tinted yellow or orange for the reason listed above! Unfortunately many vitamin C serums are tinted and you will not be not be able to detect if it is oxidized by simply looking at it!